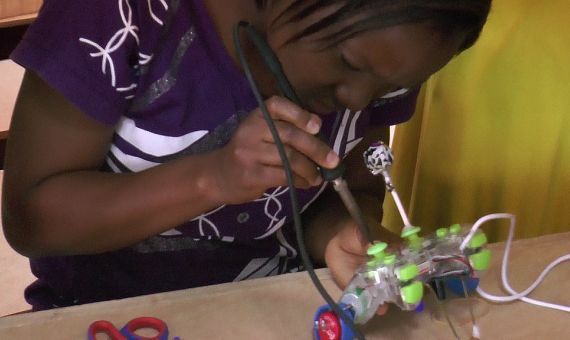 Last year, in Nairobi, a group of students between 7 and 8 years of age set out to build a robot. The cost of the device, out of recycled materials like a PC mouse chassis and discarded DVD player motors, was well under $10. The projects objective, Panyabot, is intended to educate a new generation of critical inventors, able to bend technology to their needs, regardless of their economic origin. This educational project was one of the winning designs at the biannual challenge organized by the African Robotics Network (AFRON). Participants include prestigious first world institutions like Harvard or MIT alongside low on resources inventors from countries like Nigeria. The project’s final aim is to create the world’s cheapest robot; one that can be easily assembled anywhere, in order to captivate young minds and draw them to science, technology, engineering and math. A girl plays witt the Lollybot robot. “Robotics have plenty of applications in Africa: landmine sweeping, drone surveillance of electric or similar installations… Among those, the most potential is to be found in education”, explains Ken Goldberg, from California. When this professor of New Media from the University of California at Berkeley, who specializes in Artificial Intelligence, travelled to Ghana back in 2012, he was amazed by the interest shown by many young in developing their own technology out of recycled components. “Africa is filled with equipment recycling experts. Many young know how to build a new computer out of two old ones, and that’s something that just isn’t taught on most first world doctorates”, says Goldberg. That’s how he and his colleague Ayorkor Korsah, computer science professor at the Ashesi University of Accra, got the idea for AFRON . First, they organized the ultra affordable educational robot challenge, for the world’s engineers to compete and create an easy to assemble robot with a cost 10 times inferior to the ones already available in first world markets. That’s how inventions like the Panyabot or the Lollybot came about. Lollybot is, in Goldberg’s words: the most innovative example of how to make an affordable robot ready to use in science education around the world. Lollybot is essentially a modified Dualshock-like joystick turned into a robotic mini-explorer. The joystick’s own motors drive the plastic bottle cap wheels while on top, attached to the controllers, two Chupa Chups serve as bump sensors, swinging as the bot runs into obstacles and activating the controllers in the opposite direction in order to reverse it’s path. The robot parts cost less than $10 and it was designed by Tom Tilley, professor at Payap University in Thailand. It won AFRON’s first challenge. That same year, L.I.O.S, a Spanish designed cardboard-made robot guided by a flashlight received a special mention. Students can Google all the necessary info on components, assembly instructions, chip soldering and handling. The association has recognized countries like Kenya, Ghana and the US for using the robots in educational projects with Highschool students. “We’re amazed at the amount of response we’ve gotten so far”, says Goldberg. AFRON currently has 400 members and its challenge is sponsored by the IEEE Robotics and Automation Society of the US. Next, they could be developing an educational product with the help of businesses: “We would like to sell ready-to-build robot kits at very affordable prices”, explains Goldberg. Recycling materials in mind, the idea is to use older production model surplus from, for example, Dualshock controllers. Goldberg says there is a Chinese manufacturer of such products interested in getting rid of their excess. Goldbergs says these kits could be African made, for example, and then distributed all around the world; not only to underdeveloped countries, but also to the US or Spain, where a boost in science and engineering interest is also needed. “The potential is endless: China, India, Russia… so many places where kids are interested in these things and have no money to put them to practice”, concludes Goldberg.